Tamadcaytion | To Be, To Be. Tutubi. 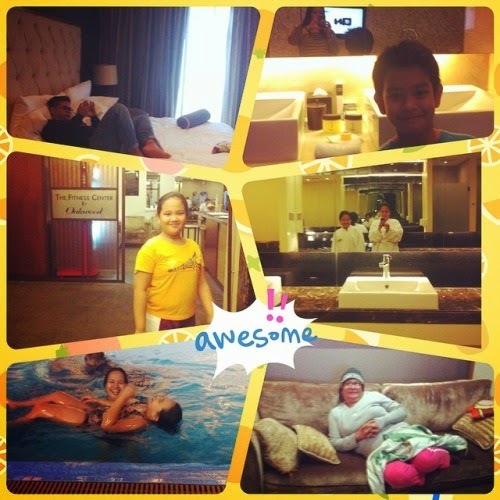 Last weekend of December, my family and I was fortunate enough to stay overnight at Oakwood Premier in Ortigas. We stayed at a One Bedroom Deluxe, which comes with buffet breakfast for two. I got the voucher from an officemate at a super discounted price so it was already worth it, even with just the buffet. The room had a full kitchen, a dining table, a living room, a bedroom and the bathroom comes with a tub. There was a dishwasher, a washing machine, an iron and ironing board and a lot of other stuff. It is a service apartment after all. The verdict? My kids loved it! We swam at the pool which has music underwater and we visited the gym. I said we visited the gym, I didn't say we worked out at the gym. We also got free parking, and free wifi access for all our devices (usually limited to 4)! I had the buffet breakfast with my son, who couldn't complain with the number of dishes on display. I was happy with my bacon and coffee! When it was time to leave, we got a call from the counter asking if we needed assistance with our bags. And then it was time to go. My kids really loved it and they want to stay longer. For this stay, I will give the hotel a 4/5 rating. And I will definitely stay here again!